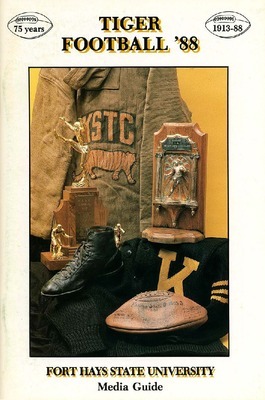 The Fort Hays State University Athletic Programs Collection is a selection of Tiger Athletics game programs and other memorabilia covering a period from 1920-2002. The original collection, housed in the University Archives, contains items from football, men's and women's basketball, volleyball and other sports. 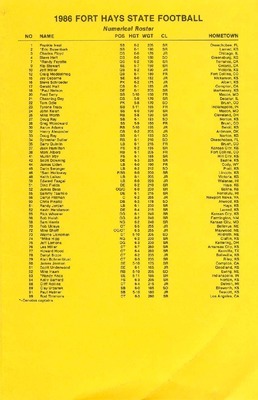 The 1989 Fort Hays State University football media guide containing schedules, rosters, and information regarding the university for use by television and radio broadcasters. 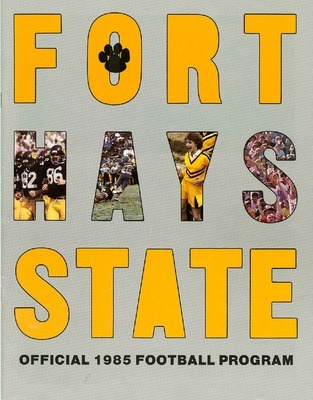 The 1988 Fort Hays State University football media guide containing schedules, rosters, and information regarding the university for use by television and radio broadcasters. 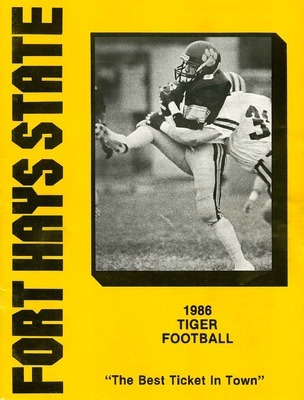 A program from the October 1, 1988 homecoming game between Missouri Southern State College and Fort Hays State University played at Lewis Field Stadium in Hays, Kansas. 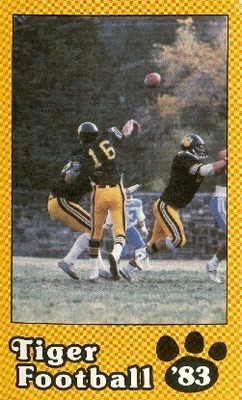 A trading card with the 1988 Fort Hays State University football schedule printed on the reverse. 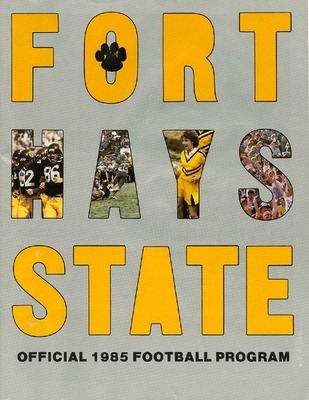 The 1987 Fort Hays State University football media guide containing schedules, rosters, and information regarding the university for use by television and radio broadcasters. 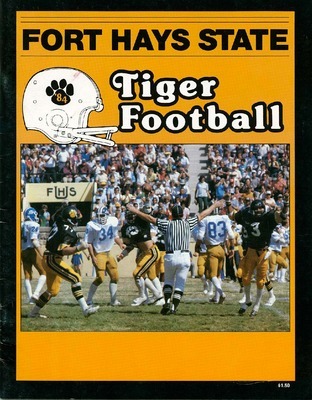 The 1986 Fort Hays State University football brochure containing schedules, rosters, and information regarding the university. The 1986 Fort Hays State University football media guide containing schedules, rosters, and information regarding the university for use by television and radio broadcasters. 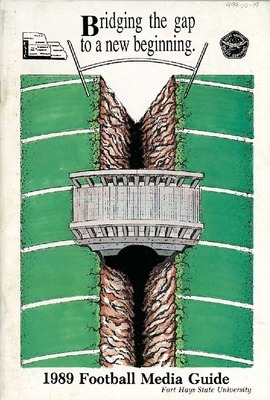 A program from the September 13, 1986 football game between Northwestern Oklahoma State University and Fort Hays State University played at Lewis Field Stadium in Hays, Kansas. 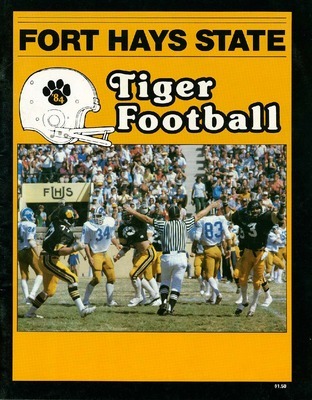 The 1985 Fort Hays State University football brochure containing schedules, rosters, and information regarding the university. 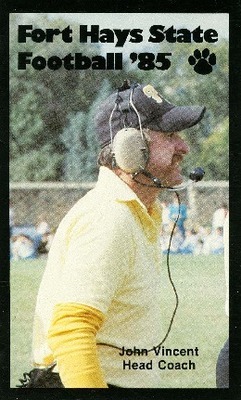 A trading card with the 1985 Fort Hays State University football schedule printed on the reverse. 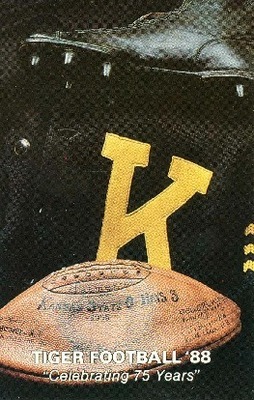 A program from the October 5, 1985 football game between Fort Hays State and Kearney State College played at Lewis Field Stadium in Hays, Kansas. 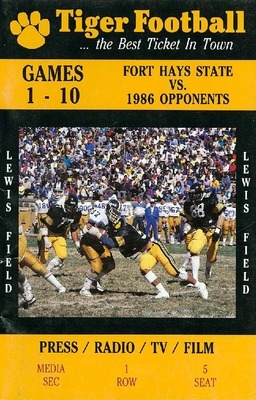 A program from the October 19, 1985 football game between Fort Hays State and Pittsburg State University played at Lewis Field Stadium in Hays, Kansas. A program from the September 8, 1984 football game between Fort Hays State and Lincoln University played at Lewis Field Stadium in Hays, Kansas. 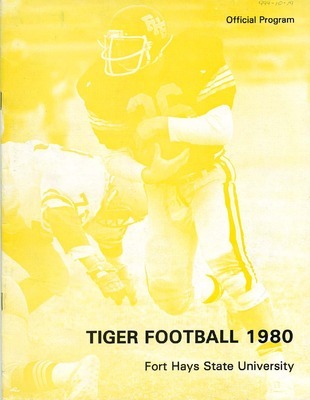 A program from the October 27, 1984 football game between Fort Hays State and Missouri Southern played at Lewis Field Stadium in Hays, Kansas. 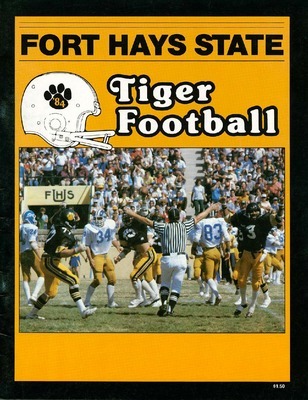 A program from the September 22, 1984 football game between Fort Hays State and Panhandle State played at Lewis Field Stadium in Hays, Kansas. 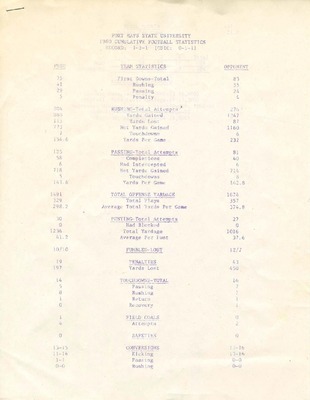 A program from the October 20, 1984 football game between Fort Hays State and Washburn University played at Lewis Field stadium in Hays, Kansas. A program from the October 6, 1984 homecoming football game between Fort Hays State and Wayne State played at Lewis Field Stadium in Hays, Kansas. 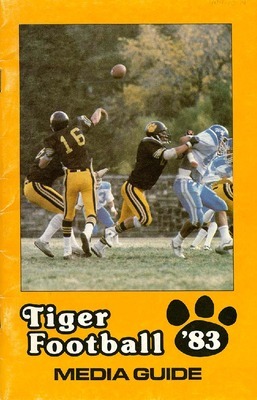 A program from the September 10, 1983 football game between Fort Hays State and Adams State College played at Lewis Field Stadium in Hays, Kansas. 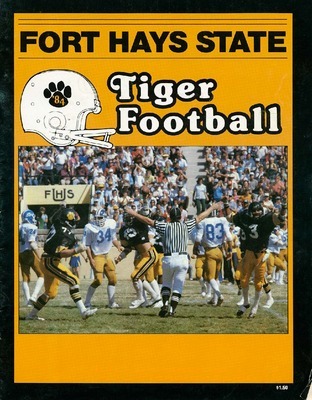 A program from the November 5, 1983 football game between Fort Hays State and Emporia State University played at Lewis Field Stadium in Hays, Kansas. 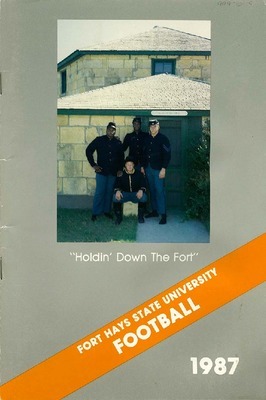 A program from the October 1, 1983 football game between Fort Hays State and Kearney State College played at Lewis Field Stadium in Hays, Kansas. 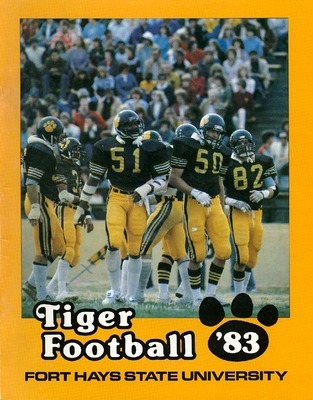 A program from the September 17, 1983 football game between Fort Hays State and Langston University played at Lewis Field Stadium in Hays, Kansas. 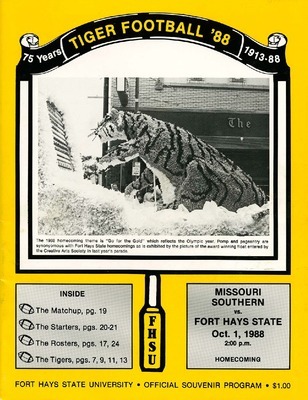 A program from the November 12, 1983 football game between Fort Hays State and Missouri Western State College played at Lewis Field Stadium in Hays, Kansas. 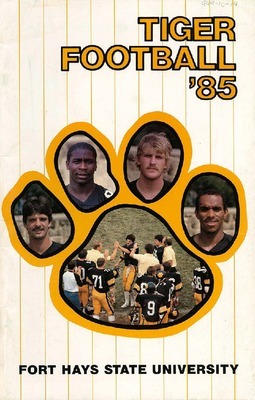 A program from the October 15, 1983 football game between Fort Hays State and Pittsburg State University played at Lewis Field Stadium in Hays, Kansas. 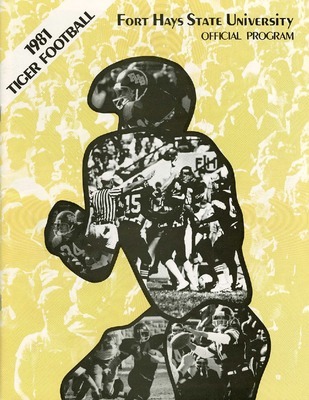 The 1983 Tiger football media guide containing schedules, rosters, and information regarding the university for use by television and radio broadcasters. A trading card with the 1983 Fort Hays State University football schedule printed on the reverse.